Cartier Art Deco Pearl and Onyx Sautoir, c.1925. Photo Courtesy of Christie’s. 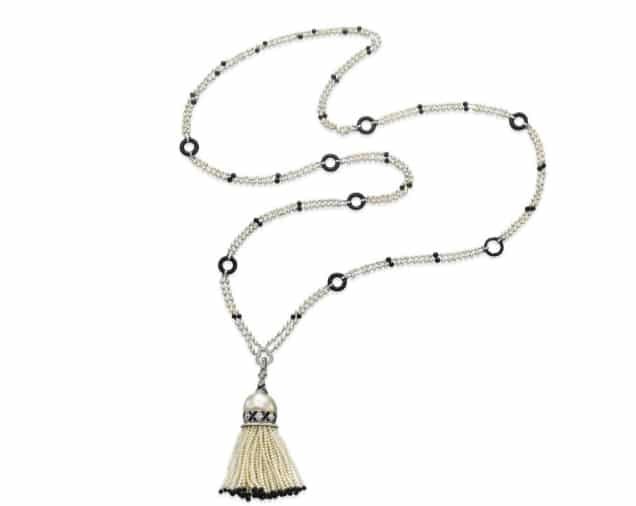 A sautoir is a French term for a long necklace that suspends a tassel or other ornament. Necklaces that would fit the criteria for a sautoir have existed throughout history. Sautoirs, as we know them today, evolved in the early part of the twentieth century in response to the elongation of the feminine silhouette created by the columnar styling of dresses of the period. Woven or twisted ropes of pearls suspending a tassel were by far the most popular sautoirs but an inevitable progression toward geometric diamond and gem-set sautoirs saw a wide variety of designs by the Art Deco period. Multipurpose adaptability was a feature built into much of the jewelry of the 1920s and 30s and sautoirs were no exception. Often they converted to bracelets, shorter necklaces and head ornaments with interchangeable pendants and tassels that could also be suspended from earrings or another necklace. This feature allowed an individual chameleon-like piece of jewelry to economically and efficiently serve more than one purpose.